Tonight was the first ride on the roadbike. Everything works (just) so it was a perfect opportunity to take it out for a quick spin. 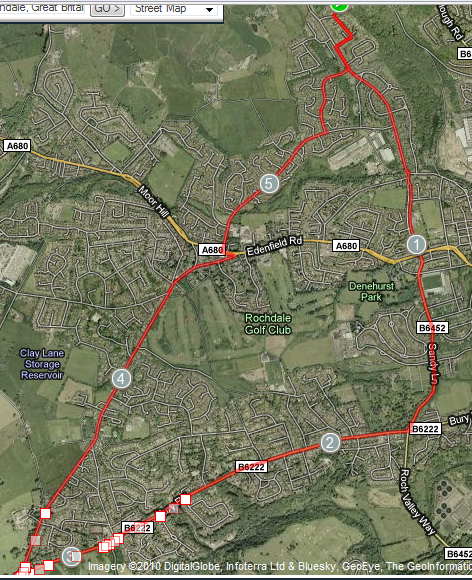 A quick ride down Rooley Moor Road, across Sandy Lane to Bury Road and a climb up Norden Road before returning via Caldershaw Road. Initial reactions are – it’s much taller geared than I expected – the climb that I easily do up Norden Road was a real toil, as was Redfearn Wood. But i’m determined and I didn’t stop on any climb. 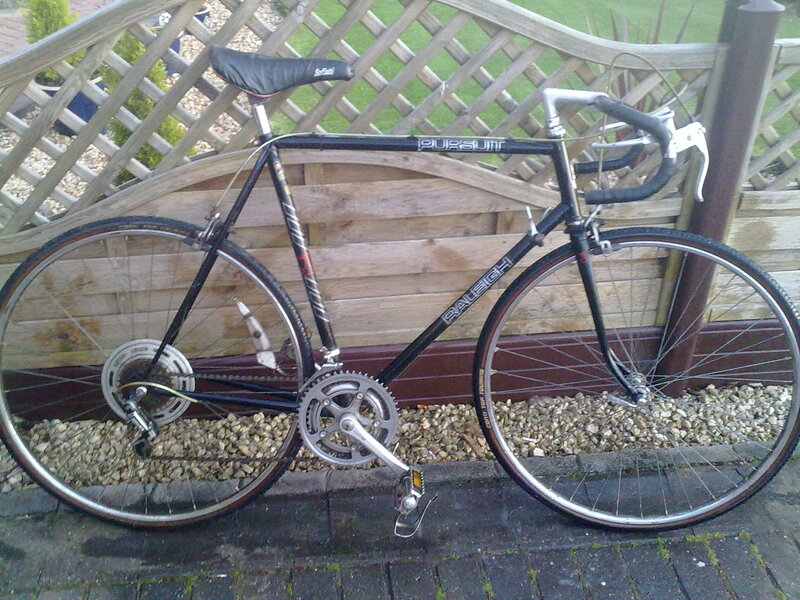 The brakes nearly work but need attention and I need to change the seating position slightly. All in all, i’m pleased and if I can get to the same speed on the climbs on this as I do on the Mountain Bike I will be very happy. ‘Ello Jon Got a New Motor? No, but i’ve got a new bike! 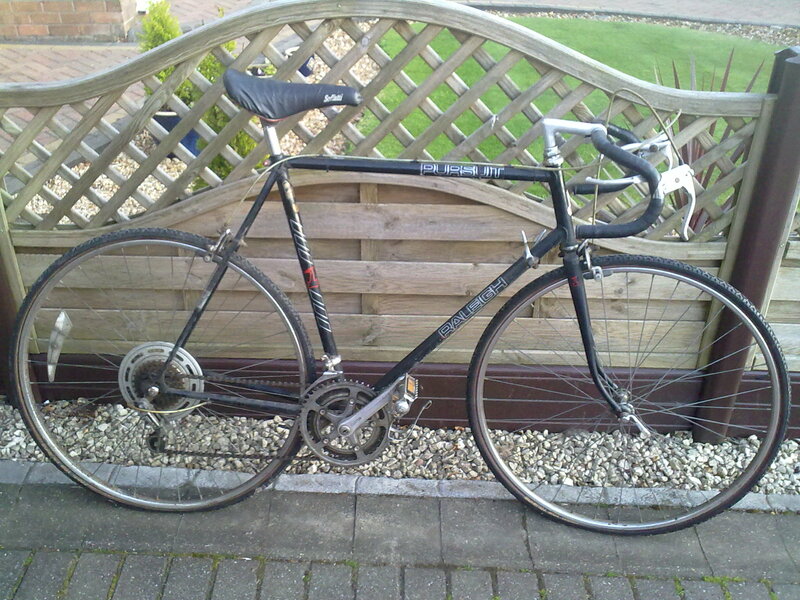 Picked it up today, it’s a Raleigh Pursuit, dating back to around 1986? 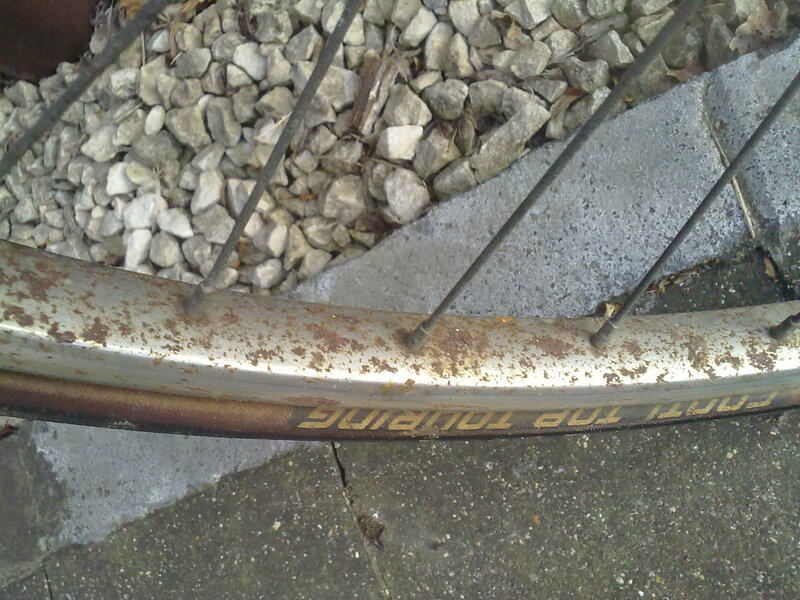 Bit mucky and some surface rust and oxidation, but in pretty good nick considering its age. I’ve given it a quick clean up and managed to pump some air into the tyres, which managed to stay inflated long enough to establish that the gears work and the brakes almost do. Fit wise, it seams OK. I’m no expert on road bikes, but it feels pretty comfortable. The only thing I noticed was the front tyre rubbed against my foot as I turned it round. 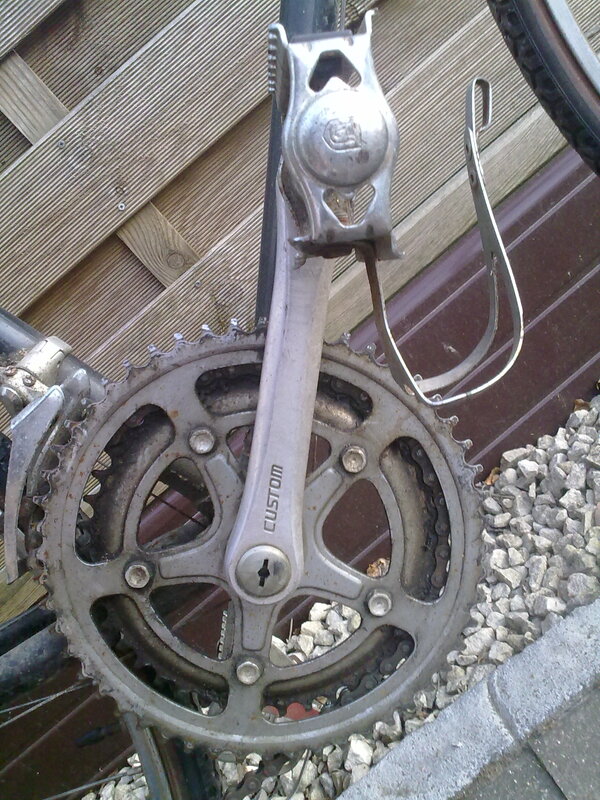 If I had had my feet in the pedals properly, I don’t think that it would have happened. It weighs 27 lbs and it’s pretty nippy. I’ll get some new tubes for it and give it a proper try soon. 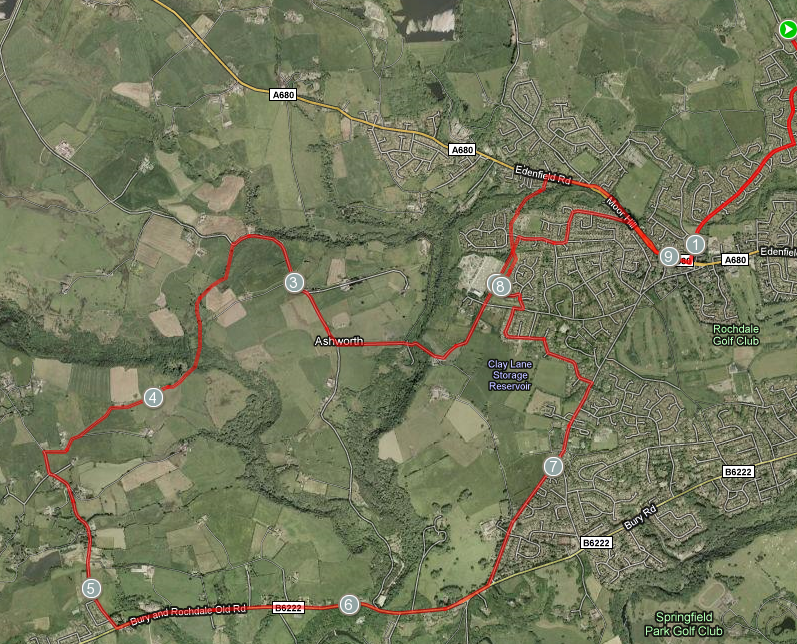 Tuesday’s ride was the first time i’d ridden over to Birtle, I know – Shocking. Lived in the area for over 10 years and have only ridden a very limited selection of trails. 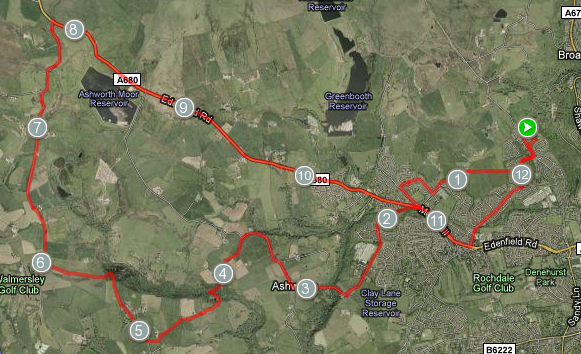 Tonight, i’m going to do a similar first part of the ride on Tuesday, but when I get to Birtle Lane, i’ll turn right and head up to Owd Betts and ride back through Ashworth Valley to home. If everything goes to plan, it’ll be just under 16 miles, probably 60% onroad and 40% off. I’d been in two minds whether I would do this years Over The Edge ride (in aid of The British Heart Foundation). 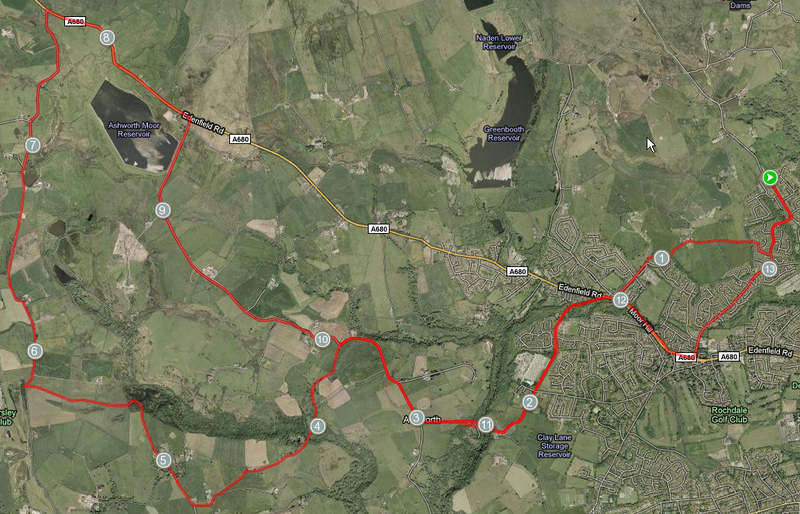 The thought of cycling up Blackstone Edge was a little off-putting and up to last week I wasn’t going to be doing it. I bumped into my Doctor at a social event this week and he shamed me into doing it. He does the ride every year. So despite being sober, I begrudgingly agreed to do the silver ride. I gave the bike a quick once over yesterday to make sure it was in a condition that would allow me to do the ride without anything serious mechanically happening and also swapped over to slick 2.1″ slicks. I drove to Littleborough this morning and found a ‘free’ parking space 3/4 of a mile from the start of the ride and cycled over. Signing up for the ride was straight forward and parted with my £13. I was now the temporary owner of a shiny number 429 that got duly attached to my Camelback. I grabbed a coffee and then bumped into Adrian (6t8) and had a chat before the ride started. Mayor Swift was there to wave off cyclists in groups of 20. Now, I’d psychologically sorted myself out for the climb as it wasn’t as steep as the climb up Rooley Moor that I usually do. However, today there was a slight sting in the tail; in the form of Roadworks, which meant that the route was diverted up Blackstone Edge OLD Road. What a horrible horrible horrible climb that is! But I managed it in one go, stopping briefly to remove my jacket (once i’d got to the top of the climb). Today’s rule was if I had to stop, it would be on the flat or on downhill bits – never on climbs. The ride joined back onto Blackstone Edge towards the White House Pub. 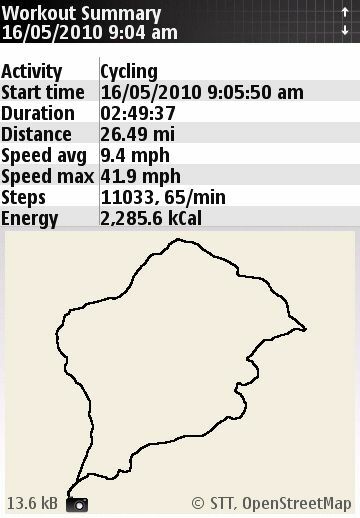 I lost count of the bikes that overtook me, mainly 9st racing whippets on expensive looking road bikes! The drop down towards Baitings Dam was really quick maxing out at 41.9mph before forking off to the left and snaking over towards Mytholmroyd. The climbs here were trying as my rear mech decided it wasn’t going to shift cleanly any more, so I made do with about half of the available gears. 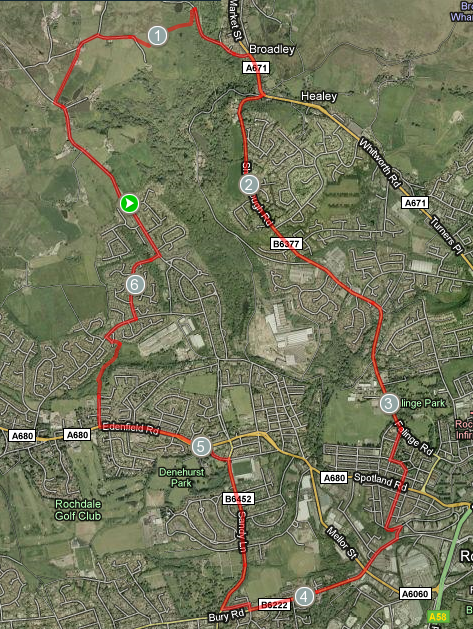 I was fairly pleased with the ride, I was managing to ride fairly cleanly and had a good cadence most of the time. But I was slightly disappointed with my time. I’d have liked to have done it 2hrs 30 mins. But there’s always next year for that! Well done to Adrian for doing it 2hrs, impressive! After finishing the ride and collecting my silver medal, I treated myself to Sausage, chips and gravy. It was the best i’ve tasted in a long time!